By Atul Kumar-Beurg in Clinical on July 4, 2015 . 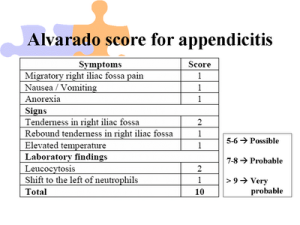 The use of the clinical scoring system by Alvarado in the decision to perform computed tomography for acute appendicitis in the ED. – PubMed – NCBI.